You may have endured months of struggle and suffering without knowing if you’re making any progress because the pull to go back remains strong. You miss the moments under your abuser’s sway because, in your traumatized mind, cognitive dissonance and memories of so-called “good times” cloud your objectivity. How do you know where you stand on your road to recovery? Victory isn’t always in-your-face. Arriving as a survivor of narcissistic abuse comes in waves, even ripples, but if you experience the following seven signs, you can feel gratified knowing that healing is within your reach. 1) You’ve begun to appreciate that self-care is something you need to participate in consistently. Not only because you are healing from emotional abuse, but because healthy people in general understand the importance of putting on their oxygen mask before they can help others. Life can be stressful enough without the added obstacle of toxic abuse. It only stands to reason that if you’re healing from narcissistic abuse, your body and mind require extreme self-care. This might include reducing social engagements, staying off of the internet, saying “no” to friends and family, taking a nap when you feel exhausted, and making time to do meditations. You resist the urge to make excuses as to why you can’t take care of yourself, realizing that even single mothers can work self-care into their schedules. If you area single mother, you deliberately get a babysitter on occasion to take yourself out. You do guided meditations at night. You journal and do mirror work. If a friend asks you to visit and you don’t have the energy, you respectfully decline. You take the initiative to be a little “selfish”, because you understand the need to do so after putting out other people’s fires for too long. 2) You do what it takes to protect your mental and physical space.You no longer acquiesce to things that intrude on your privacy and peace of mind. Most narcissists and other Cluster-B disordered individuals pull out all the stops when trying to hook a previous source of supply back into their realm of crazy. They pretend to have changed, to want to be friends (especially for the “sake of the kids”), to be just another normal person going through a typical breakup or divorce. They may go so far as to tell you their relationship problems with their new partner. Arriving as a survivor means you no longer want, nor tolerate, any of those things. You want peace and autonomy so badly that you are willing to go complete No Contact and resolve not to let them into your home anymore. You don’t leave yourself open to any of their tomfoolery, and instead put up all necessary boundaries to protect your new sense of peace. 3) You no longer care about how your Ex will react to your decisions. You don’t worry whether your life choices will make your Ex angry or make life “inconvenient” for them. You understand that true fulfillment means honoring your own dreams, desires, and ambitions regardless of how your ex may respond. As long as you abide by any court orders in place, you know that your future is in your own hands. 4) You may start to notice that some of your other relationships have been a big energy and time drain, and you resolve to do something about them. You’ve gotten into the habit of honoring yourself and releasing that which doesn’t serve your highest good. Consequently, you’ve become more sensitive to other relationships in which you feel taken advantage of. This doesn’t mean that you would dump a friend in need, but rather that you’ve started noticing your relationship ‘climates’. In the same way that a long-term weather pattern creates a climate in a particular region, if the climate of any of your relationships has proven – over time – that you typically feel put upon and used, then those are the ones that you now consider releasing. 5) You’re more concerned about what you’re doing with your life than what your Ex is doing with theirs. You no longer obsess about your Ex with their new supply or the fact that they seem so happy because you’ve come to understand that your Ex is destined to repeat the same cycle of abuse with anyone they are with at any given time. 6) You no longer focus on problems, but on solutions. You realize that you have the power to conquer and change your circumstances, rather than remain defenseless against whatever stunts your Ex might be playing. You understand that for every action, there is an equal and opposite reaction. If you need to delete an email you’ve had for years because your Ex emails you from different accounts, you delete it. If you need to file a restraining order because your Ex is stalking and harassing you, you drive to the courthouse and file it. If you see the need to change your cell phone number and insist that they call you on your landline, you do so. If your Ex sends you unwanted gifts and flowers, you mark them “return to sender” or refuse the delivery. You fight the good fight to protect your newfound freedom. 7) You no longer consider what happened to you a punishment, but rather an eye-opener because you understand that it happened so you could heal the wounds you’ve carried since childhood. 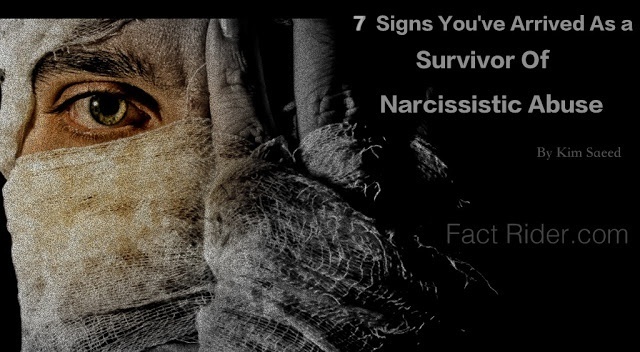 You’ve arrived as a survivor from narcissistic abuse because you no longer look to your Ex for approval or appreciation, knowing that even the appearance of those things comes with a high price. You accept that there are people whose behavior is disturbingly damaging, but you no longer open yourself up to it. Instead, you respond appropriately, with full awareness of why it’s necessary to do so. You’ve arrived as a survivor because you no longer tolerate anything that discounts your value – from anyone – for you’ve become your own best friend and advocate.